Here’s a challenge for you. Draw the structure below in ChemDraw – so that it looks as pretty as it does here* – and let me know how long it took you. If you can do it in under 3 hours, you’re a better ChemDrawerer** than I am. Of course, you probably have much better (and more interesting) things to do with your time. This entry was posted in Fun and tagged chemdraw, dendrimers, hell, structures. Bookmark the permalink. It seems that the best way to include ChemDraw images in papers is by directly embedding them. The structures always appear crisper, probably because they are treated as vector (vs. raster) graphics. But, if you can’t directly embed the ChemDraw objects, what works best? To create ridiculously oversized structures then save them as a high-resolution (e.g., 400 px/inch) TIFF? These never seem to look anywhere close as good, but I know of nothing better. I’ll give EPS a shot. I seem to be in blurry-figure hell. Another good tip is to make sure you have anti-aliasing switched on in ChemDraw. For Chemistry World, we tend to export ChemDraw as TIFFS and the design guys tweak them in Photoshop or Adobe Illustrator if need be. I didn’t know about the anti-aliasing… that’s a good tip (turns out it was on anyway)! At first glance, sure, it seems like it would be simple. But give it a try — you’ll most likely be surprised at how fiendishly difficult it actually is. You need to get the font sizes right for the atom labels, not to mention the bond lengths. And, overall, the length of each monomer depends on what size circle the dendrimer describes… it really isn’t as easy as you might think. Relatively simple to generate the SMILES since it’s so iterative, but not sure how Chemdraw would render it when you paste. My guess would be a mess — but maybe I would be pleasantly surprised! My hunch would also be to put it into a vector graphics format, then run some sort of script on it to rotate it. I don’t know vector graphics well enough to pull it off, but it looks like just a harder version then the standard ‘draw a three’ computer science class exercise. The hard part is doing it faster then you can draw the chemsketch structure, unless of course the paper you are working on has a dozen of these things, at which point you could probably learn the graphics format, programming language AND still do it faster then drawing these out in ChemSketch. Oy… Reminds me of my own thesis, except we used carbosiloxane cores instead… Good luck with that! I thought of another way to draw then: There are a number of LaTeX packages to draw chemical structures. Normally these don’t see much use, since it is easier to use GUI drawing software, however in this case I think it might be easier to use them to generate one arm in LaTeX code, which can then be modified to have a rotation around a central point. Of course, you’d have to already know TikZ or pstricks, both of which are rather specialized areas of LaTeX, but it could work. With all the symmetries involved, this looks relatively straightforward to do in Illustrator. Just start with some end pieces and do rotate and duplicates with a typed in angle. Then group it and build inward. Illustrator can crank out EPS or SVG pretty easily. On the other hand, Illustrator costs a fair bit, so it would pay to try out Intaglio or the like, or see if you have strong LaTeX fu. I moved to AccelrysDraw (free version; I’m retired) for a reasonably trivial reason: there are templates for lone pairs and sundry other orbitals. It’s quite nice and brings back memories of ChemText. I would say that the trouble with chemical drawing packages is the lack of a means of calculating and typing in rotations and displacements (with duplication) with respect to reference points that are not necessarily chemically significant. The obsolete but very cheap general drawing package Graphicsworks was good for that & it had a programming language useful for iterative stuff. There was a built-in function for duplicating an object evenly round a circle. Also I got fed up with wordprocessors and did the huge latex download. Fortunately I’m old enough to be familiar with markup, which I quite like. Latex likes EPS. AccelrysDraw can do that & I don’t see any need for anything else. If you compile Latex straight to pdf, your figures need to be pdf. It’s best to generate these pdf from the EPS so as to stay in control of the canvas dimensions. As always, you have to work out what Latex is doing when it tries to float your images into free spaces, but at least you can see the code. Also, numbering Figures etc. is easy with Latex. If you mess that up with Open/LibreOffice (very easy to do), you’ve more or less had it. Likewise, Latex has a stable and unchanging maths package. I havn’t yet tried its chemistry package. I think it took me about an hour. It was a fun challenge. Chemfig syntax can get a little out of hand sometimes, but since this molecule is so iterative, it actually wasn’t bad. I know there’s some extraneous code in there, but not too much. I used the bold bonds from that page instead. There are also some lines in my style file that are from elsewhere on that site. Chemfig diagrams can take a while to render. I normally keep them commented out until I’m getting ready to print or submit my work. This diagram took about 45 seconds to render on my 3.4 GHz quad-core. Well Stuart, this is really a nice challenge! I have read this post yesterday and this is only one of my very first approaches. At first, this should be done almost entirely with ChemDraw (I’m using the ChemBioOffice version 13). With “ChemScript” in addition you are able to apply transformations (=reactions), e.g. 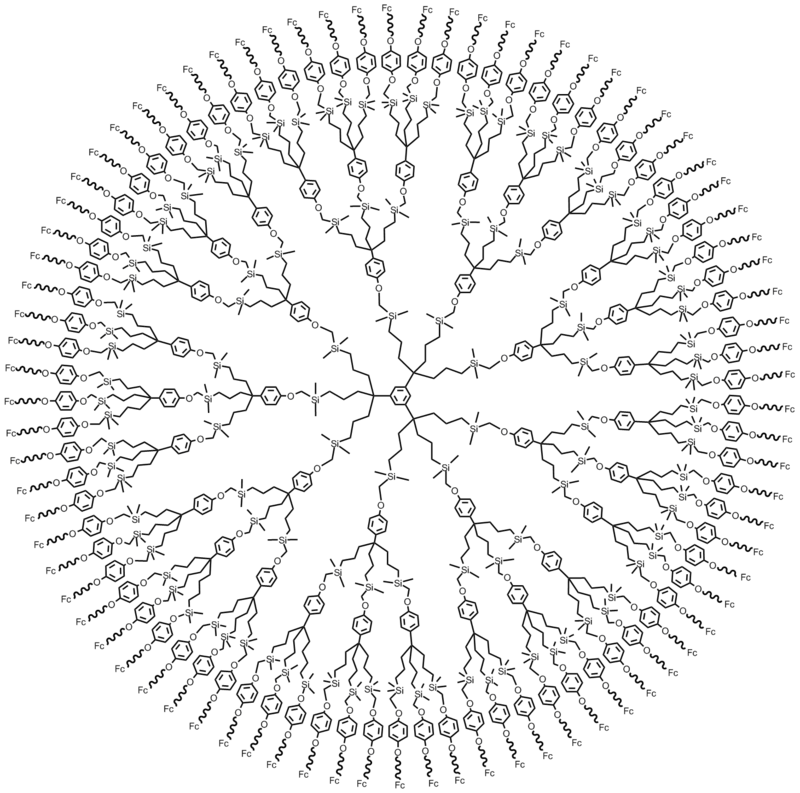 R1-OH -> R1-O-C6H4-(spacer)-OH and so on… Okay, this idea leads us to the idea of making your dendrimer by generating in a interative way. One have to save this in the “\Chemistry Rules” subfolder related to the path above. contained in CD’s “Alternative Group” box (with “R1” as header). The much more difficult part ist to beautify the resulting structure.I think this could be tackled with ChemScript again or manipulating the cdxml-file, maybe with my prefered software Mathematica. As soon I have a sufficient good solution I will post it here! I need to design a molecule with silsesquioxane in ChemDraw! I can not adjust the connections and the geometry of the molecule! can anybody help me?